The GLADIATOR tungsten carbide bracelet is one of our most popular designs! 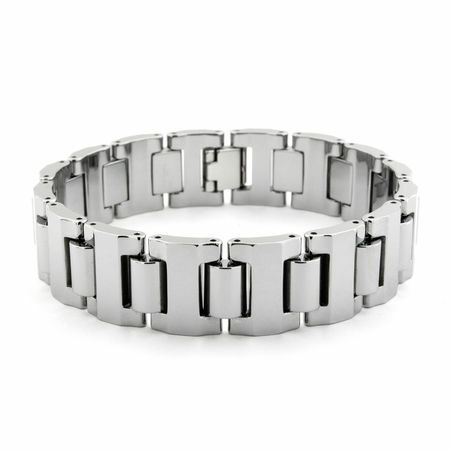 Measuring 16mm, 5/8", this tungsten bracelet will quickly become one of your favorites. The links are made with a high polish giving jewelry a handsome shine. An excellent companion for any of our tungsten ring collection. Measures 8.5" long. If you like a heavy weight bracelet, then this one is for you. I work with steel all day. So I do know a little about tool steel and powder steel. 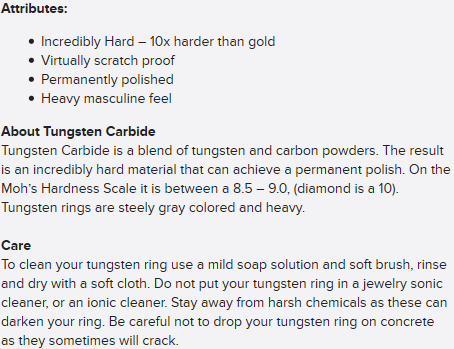 I have been wearing this same high carbon tungsten steel bracelet for five years. It never comes off my wrist. Never ever. I hope this helps you sell more of this product. P.S. never looses it's luster. nice and heavy,easy to take off and put on by yourself with no need of a helping hand. Wear this bracelet all the time. Doesn't scratch as I have bumped it many times and is so easy to clean. Always looks like it came out of the box and I have received many compliments since I started wearing it. The finish is great. This is a great bracelet... Heavy, doesn't scratch and very impressive. People comment all of the time on it. I bought 2 of these lovely bracelets and asked titanium-jewelry.com if they could be made into a choker. I received them already put together in a beautiful necklace box. It looks simply amazing on my wife. After 6 months of looking for anything that came close to this piece... they delivered. Fantastic bracelet... Highly polished, rugged... Looks great on the wrist.. easy to remove the pins too! I love my bracelet. It is big, manly and ALWAYS looks polished. One of the links broke after over a year of wear and Titanium sent me another link out immediately with now questions asked. What other company does that?? I have had three of these bracelets. I continue to buy them although I wish the pins and clasps were made as well as the rest of the jewelry. The pins will corrode and break after daily use. But I still love this bracelet.